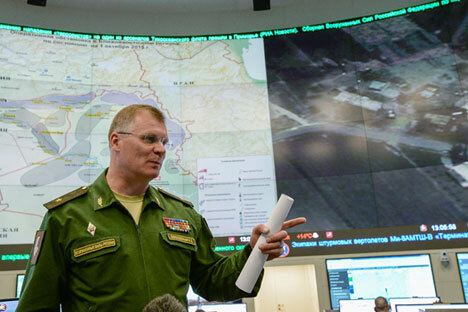 Russian Defense Ministry Spokesperson Major General Igor Konashenkov gives a press briefing at the National Defense Management Center in Moscow. Al Jazeera reports five Russian servicemen dead in Syria. Russian Defense Ministry disclaimed media reports of five servicemen being killed in Syria. The report of the Al Jazeera television channel about the death of Russian military in Syria is false, all Russian servicemen in the Syria are well, spokesman of the Russian Defense Ministry Major General Igor Konashenkov said on Feb. 5. "The reports of Qatar’s Al Jazeera’s television channel about the death of Russian military in Syria are another falsifying," he said. "All the Russian military, who are in the Syrian Arab Republic, are alive, healthy and continue carrying out assigned tasks," the general said. Earlier, Al Jazeera reported five Russian servicemen died near Syria’s Tartus.